If you have stained, slightly gapped, crooked, crowded or misaligned teeth, then you may be reluctant to smile for photos or meet new people. Furthermore, having smile flaws can leave you with less confidence, but this is not how your story has to end. Through the help of your cosmetic dentist in Herndon, you can enjoy a remade smile with porcelain veneers. What should you expect from the process, though? Is it painful? Read on to get the answers you need, so you can get on the road to smile perfection! Porcelain veneers are very thin shells that are custom-crafted from high-grade ceramic material. The tooth-colored applications fit right over the digits in what’s called the smile zone (the portion of your teeth that are visible when you smile). Preparation – Your dentist prepares your teeth by removing a thin layer of enamel, which allows your new veneers to fit properly. 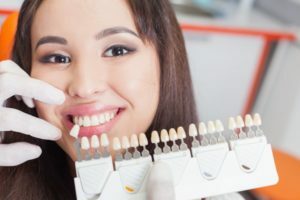 Bite Impressions – Next, bite impressions are taken that will be sent to an in-network lab and used to fabricate your permanent veneers. Temporary Fitting – To protect your teeth during the creation of your porcelain veneers, your dentist will fit you with a set of temporary fixtures. Final Placement – When your permanent veneers return from the lab, you’ll head back to your dentist’s office to have them placed. The final result will be a beautiful smile with no stains, gaps or other undesirable flaws. When it comes to any dental procedure, one of the first questions that comes to mind is, “Will it be painful?” One of the great perks of having porcelain veneers in Herndon placed is that the process is painless. Thus, you’ll be able to vastly improve your smile without having to suffer for the results. Once you’ve acquired the smile of your dreams, you want to maintain it. To accomplish that, be sure to brush and floss your teeth as you normally would to remove harmful bacteria and plaque that seek to wear down your underlying teeth and gums. Additionally, you should make it a habit to visit your dentist every six months for preventive care. The thorough cleaning and examination you’ll receive at each appointment will ensure that your oral cavity is in the best shape possible and that your porcelain veneers are still in good shape. If you’re tired of living a restrained life because of your smile flaws, then you now have a way to turn the tables around with porcelain veneers. To learn more about the process, reach out to your local dentist to schedule a consultation today! Dr. Farshad Bakhtyari earned his dental degree from Boston University. He then went on to attain his Advanced Education in General Dentistry, which equipped him with the added knowledge and experience to provide competent and comprehensive care. Dr. Bakhtyari helps patients rebuild their confidence and live happier lives with porcelain veneers at Premier Dental Care, and he can be reached for more information through his website.